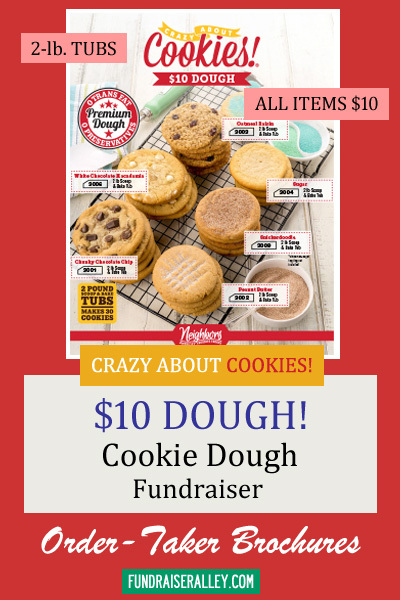 The $10 Dollar Dough Order-Taker Brochures offer 6 popular flavors of cookie dough for fundraising success! All cookie dough is in 2 pound tubs that sell for $10 each. The only choice customers will need to make is the flavor. (And, that will be hard to do.) Each case has 6 tubs of dough and there is a 20 case minimum order. Cookie Dough is one of the most popular fundraising products for schools! Who doesn’t love to smell cookies baking? Sell Tubs for only $10 each! 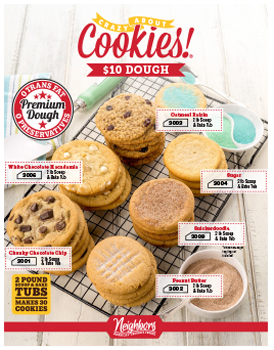 The colorful Crazy About Cookies – $10 Dough brochures offer 6 varieties of yummy cookie dough in 2 pound tubs. All tubs are priced at $10 each.